The grizzly bear (Ursus arctos horribilis), also known as the silvertip bear, is a subspecies of brown bear (Ursus arctos) that lives in the uplands of western North America. Normally a solitary active animal, in coastal areas the grizzly congregates alongside streams, lakes, and rivers during the salmon spawn. Every other year females, (sows) produce one to four young (most commonly two) which are small and weigh only about 500 grams (one pound). Sows are very protective of their offspring, and will attack the predator, if the female Grizzly thinks it's being threatened. Grizzly bears reach weights of 180–680 kilograms (400–1,500 pounds) and stand 2.44 m (8 ft) tall on their hind legs; males are on average 38% larger than females. This sexual dimorphism suggests that size is an important factor in the male's ability to successfully compete for and attract breeding opportunities. Their coloring ranges widely across geographic areas, from blond to deep brown or red. These differences, once attributed to subspeciation, are now thought to be primarily due to the different environments these bears inhabit, particularly with regard to diet and temperature. The grizzly has a large hump over the shoulders, which is a muscle mass used to power the forelimbs in digging. The head is large and round with a concave facial profile. In spite of their massive size, these bears can run at speeds of up to forty kilometers per hour (twenty-five miles per hour). Grizzlies can be distinguished from most other brown bear subspecies by their proportionately longer claws and cranial profile which resembles that of the polar bear. Compared to other North American brown bear subspecies, a grizzly's pelt is silver tipped and is smaller in size. This size difference is due to the lesser availability of food in the grizzlies landlocked habitats.They are similar in size, color and behavior to the Siberian Brown Bear (Ursus arctos collaris). Identify what type of bear you are up against. A Polar bear, Grizzly or brown bear will weigh upwards of 800lbs, fighting one would be suicide. A black bear however would weight around 300lbs. Ironically a greater percentage of attacks on the part of a black bear are predatory in nature. Note: Attacking a bear is foolhardy and cannot be justified for the sake of a fight DO NOT FIGHT A BEAR FOR THE SAKE OF FIGHTING A BEAR wikihow and its authors will not be responsible for your mistake. Defensive vs Predatory: It is important to recognize if you are facing a defensive bear or a predatory bear. If you find yourself being physically assailed by a male black bear or an unaccompanied female bear the best order of business is to treat your personal defense as if a large cat were attacking you. This is because just like a large cat a predatory bear will not stop attacking you if you go into the fetal position. This differs drastically from a defensive bear, who upon discovering you are not a threat, will leave. Therefore if the bear is predatory in affect, the best defense is a good offense. Yell at the bear. Show it you are not afraid. This will put you and the bear on equal footing. The bear now knows he is not getting his food without a fight. Also note that if a bear perceives vastly superior aggression he will most likely leave. If the bear has attacked you without provocation it will most likely keep attacking you until you are dead. In turn the bears prey drive may overcome its ability to distinguish pain and or the threat you pose to it. If that is the case you may need to kill the said bear. Understanding your odds: Bears can run up to 35MPH, Black bears have gotten up to 840 pounds. Almost all black bear vital organs are protected by no less than four inches of muscle and fat. One record showed that a baby black bear hunting for grubs moved a boulder with one forepaw, this boulder weighed 350lbs. The bear was latter captured and was found to weigh 110lbs. Bears have extreme amounts of stamina and can run at full speed for miles on end. Bear olifactory awareness is very acute and can extend in a bubble outward, up to 2 miles away. Only black bears and smaller species can climb up a tree, however other larger bears have been known to knock them down. Understanding bear weaknesses: Bears are very shortsighted and have very poor peripheral vision hence the reason they stand on their hind legs (to get a better view and smell). They cannot stand erect on a steep grade. Their neck muscles and jaw structure provide more resistance for turning their necks. Bears have smaller brains and less visual processing ability. Exploiting bear weaknesses:by defending yourself on a steep grade you can ensure that a bear will at least have a difficult time standing erect. From that position they can ultimately use their own weight to harm you. Also note that that attacks from the side are difficult for the bear to see. However they attack horizontally as well inhibiting your own horizontal strikes. Defense: One cannot take a strike from an adult bear, these large swipes have been known to kill elk and deer in one movement. Distance is your ally while you attack. Bare handed one does not have a safe enough reach to harm the bear. Strait line kicks such as the gastropedes will be your most effective strike. This manouvour is the stereotypical police door breach kick. While you do this strike it is important that you draw your leg back quickly as failure to do so may give the bear time enough to swipe your inner thigh effectively disarming you. Gastropedes effectiveness: The gastropedes was originally used by Greek pankration fighters as a gut kick. However, on a hill, the bear will be lower than you and will lead its attack with its head because of the difficulties of standing. A bears neck, Skull and rigid jaw muscles can be used as resistance. If done correctly a landed kick to the face may cause hemorrhage due to a bears resistance to whiplash. Threat Assessment: At this point it is important to recognize that the bear will see you as a threat. Observe that it will either run away or continue its assault until it has removed its perceived threat. Strike and move uphill, strike and move uphill. Four things must be kept in your head for this to work. Quickness, Distance, Aggression and Strike Power in that order. Small bears including black bears can be scared away with noise. However larger bears are curious and will come towards noise. That includes large black bears. Almost all small bears can climbs trees. Larger bears have been known to knock them down. Bears are among nature’s most majestic creatures, and seeing one in the wild is an unforgettable experience. Get too close, however, and your encounter with a bear can be more terrifying than awe-inspiring. Fortunately, despite humans’ continued encroachment into “bear country," attacks on people are rare, and fatalities are even rarer. Still, bears are immense, powerful wild animals, and any meeting between bears and humans can potentially turn deadly. Do you know what to do if you find yourself face to face with a bear? Read on, and hike safely. Avoid close encounters. If you can prevent an encounter with a bear, the rest of the steps are unnecessary. As luck would have it, bears are reclusive creatures, and they generally prefer to steer clear of humans. You can help them to do so by announcing your presence when you’re exploring their home environment: talk loudly, sing, or carry "bear bells" so bears have time to escape you. 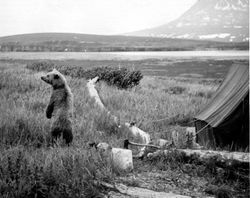 Be sure to heed local bear advisories and practice proper food storage techniques while camping, and try to hike in open areas so that a bear can see you (or you can see it) from a distance. Leave dogs at home or keep them leashed. If you see bear tracks, make a detour or leave the area. Avoid surprising bears. Keep your distance. If you see a bear from a long distance (greater than 300 feet), leave the area. If you need to continue on, make a wide detour around the bear. If the bear has not seen you, do not disturb it: retreat calmly and quietly, and then make ample noise when you are well away to prevent future chance encounters. If the bear sees you, begin speaking in a low, calm voice (it doesn’t matter what you say) and retreat slowly, keeping an eye on the bear but avoiding direct eye contact. Your goal is to communicate to the bear that you are human (i.e. that you can defend yourself and are not frightened) while also letting it know that you are non-threatening, and that you are leaving its territory. Stand tall, even if the bear charges you. If the bear sees you and is closer than 300 feet, or if the bear is approaching you, remain calm and try to look as large as possible. Try to back away slowly—do not run—and speak softly. If the bear continues to approach as you back away, stop and stand your ground. Speak more loudly in a deep, calm voice, and wave you arms to make yourself look bigger. Keep an eye on the bear, but avoid direct eye contact. Do not be aggressive, but do not crouch down, play dead or otherwise show fear or vulnerability. If the bear charges you, muster all your courage and stay where you are: the charge is most likely a bluff, and if you stand your ground the bear will turn away. Know your bear. The steps you take to survive an encounter with a bear will depend in part on the type of bear. North America has three kinds of bears: brown bears (grizzly and Kodiak brown bears), black bears, and polar bears. Polar bears, of course, are easily recognizable, and their range is limited to the far northern latitudes. Grizzlies and black bears cannot necessarily be differentiated by their colors. Grizzly bears can weigh up to 800 lbs., and they are distinguished by a prominent shoulder hump and a rump lower than the shoulder. Black bears are typically smaller (up to 400 lbs. ), and have a rump higher than or at roughly the same level as the shoulder. If you see tracks, grizzly bears have claw marks well separated from the paw imprints, while black bears’ claw marks will be quite close to the paw imprint. "Shrink" the bear. A little bear psychology can go a long way—your response to an attack should be shaped by the bear’s motivations. First, if a bear appears to be stalking you (disappearing and reappearing, for example), or if a bear attacks at night, it most likely sees you as food, and any attack will be predatory. If you surprise a bear on the trail, if the bear has cubs, or if the bear is eating from or protecting a carcass, the bear will most likely be acting in self-defense. Climb a tree only under the right circumstances. Black bears are adept climbers, so climbing a tree will do you no good with one of them. Grizzlies, too, can climb a little, and they can reach up to 12 feet into the tree from the ground. Only consider climbing a tree if you encounter a grizzly and you are confident you can make it well up (at least 15 feet, but preferably 30 feet) into a sturdy tree by the time the bear reaches you. Bears are fast, so do not try to race a bear to a tree—you will lose. This approach is usually only viable if you are right next to the tree, and you’re a good climber. Play dead if a grizzly bear or polar bear makes a non-predatory attack. If the bear (other than a black bear) is attacking you in self-defense, you can put it at ease (and save yourself) by playing dead by lying completely flat on the ground. Do so only after the bear makes contact with you or tries to do so. (In the past, bear experts recommended that one fall to the ground in a fetal position but researchers have since proven that doing this only allows the bear to easily flip over the human in question.) To play dead, lie flat on the ground protecting your vital parts with the ground, and your arms protecting your neck with your hands laced behind the neck. Keep your legs together and do not struggle. Once the bear leaves your immediate vicinity, wait several minutes before carefully looking to see if the bear is still around. A bear may look back and may return if it sees you moving. Fight a black bear attack or any predatory attack. If the bear is a black bear, or if you have determined that the bear sees you as food (this is actually quite rare, and more common with black bears and, some say, polar bears than with grizzlies), your only chance of escape is to fight it or scare it away. Hit the bear with rocks, pots, pans, sticks or fists—anything handy, really. The odds may seem against you in a fight, but bears generally do not see humans as prey, and a bear that makes a predatory attacks is usually immature, starving, or wounded, and may easily be scared away if you hit it. While a bear standing on its hind legs appears very intimidating, this is usually a gesture of curiosity, and the bear is just trying to get a better look at you. Carry bear spray. Bear spray is pepper spray in a specially designed container, and it has proven to be an invaluable deterrent. You will need to wait until the bear is close to you, however, (about 15-20 feet), before you can effectively deploy it. Be careful, though. Bears in some regions such as Yellowstone and The Grand Tetons have become accustomed to bear spray. When they are sprayed, they will turn their heads. A direct spray to the face is the only way you will be able to deter a bear. In most cases, you will only have one shot at this, so make it your best. A way to get around this is to spray a quick short spray at the bear. If the bear turns on this spray you will not have wasted all your spray. If you have a firearm, use it to save your life if needed. This is no time for gun rights discussions. This bear will kill or maim you. If it comes down to it use the weapon if you know how to use it properly. If you must shoot a bear, wait until it is close (30 or 40 feet at most), and aim for the low neck or chest area. If you injure or kill the bear, be certain to report the encounter to the proper authorities. If you need to play dead and you’re wearing a large backpack, the pack will add some protection to your vital areas, and you can lie on your stomach with your hands clasped behind your neck. Use your legs and elbows to try to prevent the bear from flipping you over, but do not struggle. If you look dead and harmless, a defensive bear will usually leave you alone. Do not keep food in your tent when camping. Always use proper food storage containers or suspend your food at least four meters off the ground using a park food pole or suspended between two trees. There are items called "bear bins" that you can buy or rent, to store foodstuffs. Remember that most species of bear are excellent climbers. Bears are attracted to smells, so keep all your trash together and don't keep it near where you are sleeping. Be sure to stow or dispose of properly of any medical supplies or hygiene products that have blood on them. Zip lock bags provide some containment. Never surprise a bear — let it know you're coming. Many hikers like to walk with cow bells or tie small bells to their feet, but many bear experts say this is not as good as talking, singing or clapping loudly as you walk. Bears are a lot more likely to recognize you as human by your voice than by a bell. If possible, walk upwind — that is, with your back to the wind. Let your scent alert any bears to your presence.